October 30, as a result of the shelling of the car, Amina Okueva was killed. The incident occurred at the railway crossing near the village of Glevach of the Kyiv region. 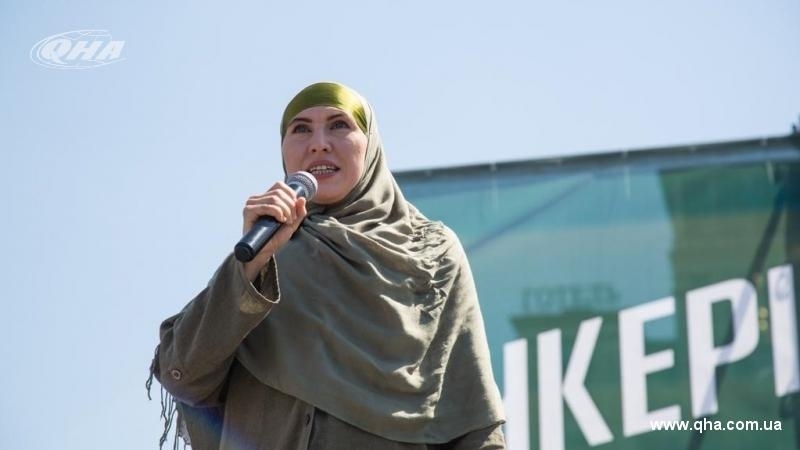 Amina Okueva was 34 years old, she was born in Odesa, but until 2003 she lived in Grozny. She graduated from Odesa Mechnikov National Medical University. Okueva participated in the Revolution of Dignity, and later fought in the ATO in the battalion Kiev-2 and Golden Gate. The People's Hero of Ukraine Okueva also participated in the creation of the International Peacekeeping Battalion named after Dzhokhar Dudaev, defended Debaltsevo and, among other things, was on the front line as a military medic. After the victory over Russian forces she planned to continue to engage in military affairs. After the resonant assassination of the lieutenant of the Armed Forces of Ukraine, the national hero of Ukraine Amina Okueva, the National Police introduced the operational interception plan Siren in the Kyiv region, according to the National Police speaker Yaroslav Trakalo. “Information about the death of Okueva is confirmed. Knyazev [Head of the National Police of Ukraine, - Ed.] left for the crime scene,” he informed. It is worth noting, that the Siren plan is introduced in case of a search for armed and other criminals of considerable social danger. Okueva's husband, Adam Osmaev, is in critical condition, according to Dmitry Linko, a deputy from the Radical Party. However, he noted that Osmaev's life is not threatened. “Osmaev is seriously wounded in the leg. Doctors say that there is no threat to his life, he is in serious condition," Linko told a 112-channel journalist. Chechen volunteers Adam Osmaev and his wife Amina Okueva were shot with a rifle, the National Police reported. “In the evening of October 30 in the Kyiv region, the unknown shot Amina Okueav and her husband Adam Osmaev from automatic weapons ... the police of the Kyiv region intend to open a criminal proceeding under Article 115 of the Criminal Code (premeditated murder),” reads the statement of the press secretary of the National Police of Ukraine Yaroslav Trakalo on the website of the Ukrainian truth on Monday evening. He noted that nothing threatens the life of A.Osmaev, the husband of the murdered A.Okuyeva. He was taken to the hospital, where he undergoes a surgery. In turn, the Prosecutor of the Kyiv region Dmitry Chibisov said that at the moment law enforcers are processing all available technical data. “A team of specialists is working; a number of means are being used to expose the persons who committed the crime. As of now, the important circumstances have been established," he said in a commentary to journalists. The Prosecutor of the Kyiv region did specify the qualification of the crime. Speaking about the circumstances of the incident, he went on saying that, most likely, A. Osmaev was at the wheel of the car, and not one bullet was fired on the vehicle. D.Chibisov also expressed his personal opinion that A.Okueva received injuries which are incompatible with life.